Thanks to the French cultural centre in Cairo (the CFCC, http://www.ambafrance-eg.org/cfcc/) for its assistance. 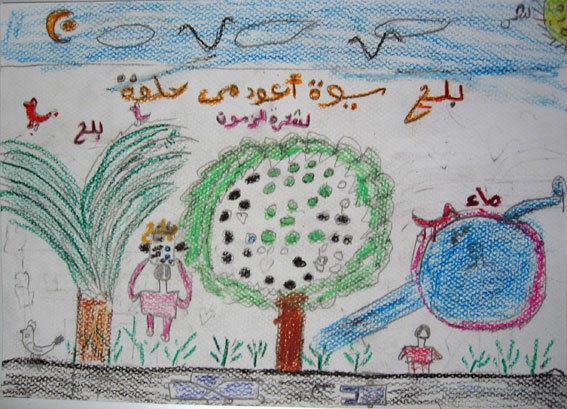 Organization of workshops of drawings with isiwan children (girls and boys between 9 and 13 years) and collection of their 40 drawings of representations of the nature, of their nature of Siwa. Analysis in progress. Children of the localities of Aghurmi (on February 21, 2001) and Siwa (on February 22, 2006) in the oasis of Siwa which have taken part in the operation of the Project of exhibition: Nature vivante (Living Nature) were all selected on a voluntary basis. The operation was carried out in private enclosure and not in the school. For administrative reasons (severity and slowness), it took place after the courses in the presence of a teacher. Les enfants siwi dessinent Siwa. 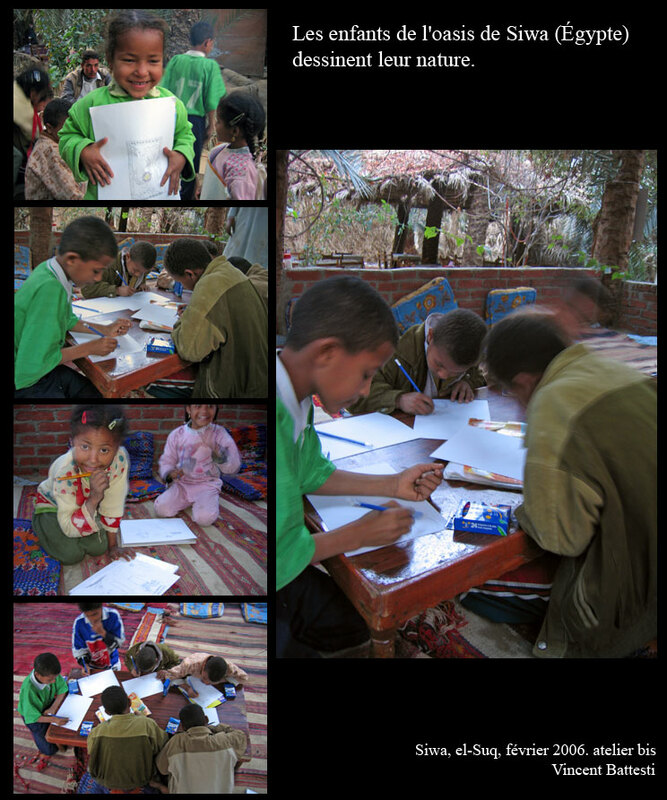 Atelier de dessin organisé à Aghurmi, oasis de Siwa, le 21 février 2006. 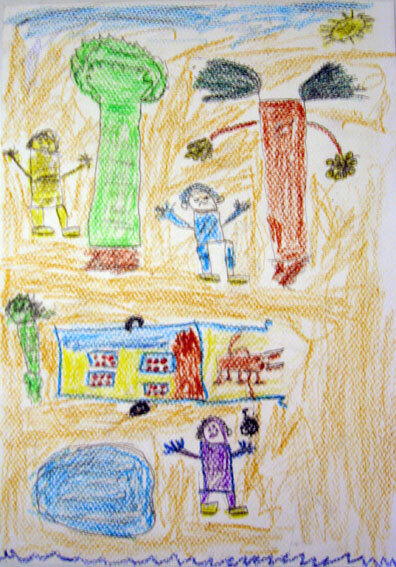 Les enfants siwi dessinent Siwa. bis. Atelier (bis) de dessin organisé à Siwa, el-Suq, oasis de Siwa, le 22 février 2006. The children were numerous to want to take part in it: boys and girls (in majority). 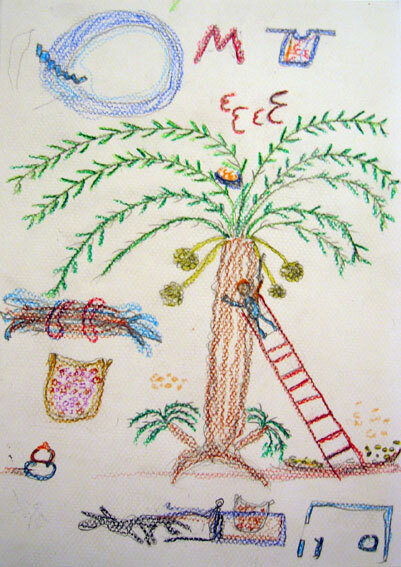 It was given to me to note that the young girls of Siwa are numerous to hold a notebook of drawings at home. In these notebooks, I found drawings identical to those collected at the time of the operation (one can think the drawing would have been identical whatever could have been the request). The drawing hardly seems developed in class, and it remains in fact an activity rather of young girl. Dessin non issu de l’atelier. Appartient à un cahier de dessin d’une enfant du souk de Siwa. 2006. All the children, in fact of nature, drew the nature which is theirs, the oasis: a garden of oasis or, by metonymy, the plants of the garden. All disregarded the desert - locally perceived like the negation of the civilized, it is the “vacuum”, nothing. 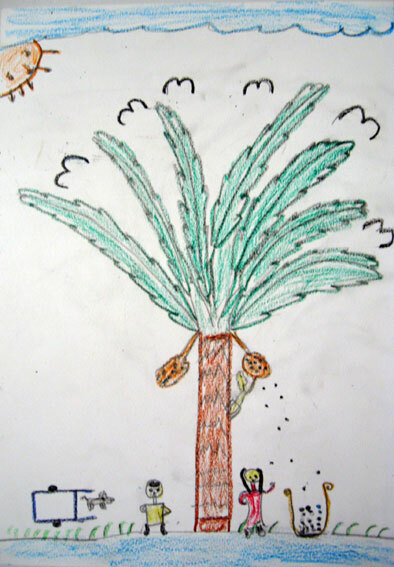 The children always drew an oasian nature, domestic and almost always with a human presence (that are represented children or adults, men or women): people works there or people finds a recreation there. Among the plants, three are chief: the palm tree - it is central, always represented -, the apple tree - it is slightly present at Siwa but representing the quintessence of the fruit tree - and the olive-tree - more rarely represented, but the most present woody tree however in the oasis. There is almost systematically a source of water drawn, a blue disc. In their oral comments, the children (in Aghurmi) always indicated it as têt djuba, the Cleopatra spring: it is neither the only spring, by far, neither the oldest, nor the most important, but the most known especially in Aghurmi. It is the spring representing all the others. An also recurring element which has surprised me: means of transport. A donkey cart or a car (even if the latter is much rarer than the cart) are almost always represented. They neglected all the bicycle, very much used by the gardeners, probably because it allows only an individual transport (and thus without the children). The animals are also very present, but are slightly varied: they are wild (birds) or domestic like the donkey (harnessed with the cart) or of the birds (geese, ducks); one will note the absence of bovines, sheep or goats, bred in stabling inside the village (and not in the garden). Geese and ducks can possibly be in the garden when this one is near the house. 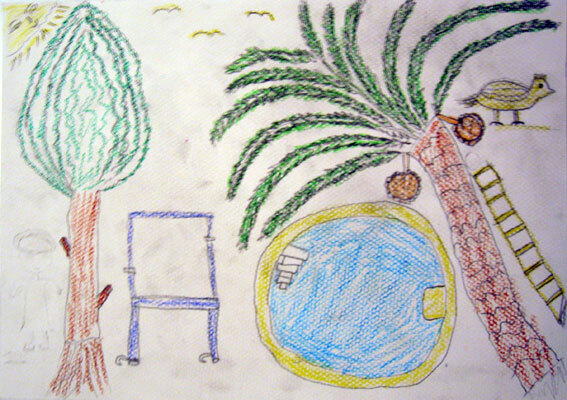 One will note the difficulty of drawing these animals, awkwardly identifiable, contrariwise to the palm trees: the donkeys are identifiable only because they are harnessed (I also had the comments of the children on their drawings), the birds are sometimes vermiform, sometimes like curious mammals. Lastly, the drawings do not render, except rare exceptions, the specific system of the oasian garden: the vegetable beds or the system of irrigation are not represented (contrary to the miniature gardens reproduced in three dimensions, like models, by the children in their plays). 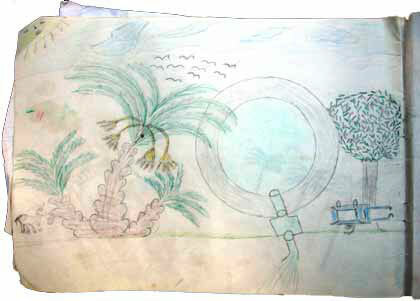 Examples of drawings realized by the children of Siwa within these workshops. This article has been read 7350 times. Nice to read you here! I knew already your work, from Siwa and from your website. I’ll be in Siwa next November (09): maybe I’ll see you there? Dernière mise à jour de cette page le Thursday 15 October 2009 à 17:12:01. //// -----> Citer cette page? 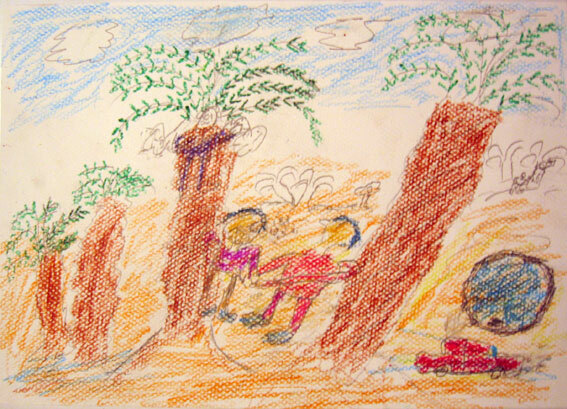 Vincent Battesti, "Workshop in Siwa: children’s drawings on nature" [en ligne], in vbat.org anthropoasis, page publiée le 3 June 2006 [visitée le 22 April 2019], disponible sur: http://vbat.org/spip.php?article288.